We all give a hoot about owls! Come meet some incredible nocturnal hunters from the Wildlife Center of Texas and learn about their amazing adaptations. 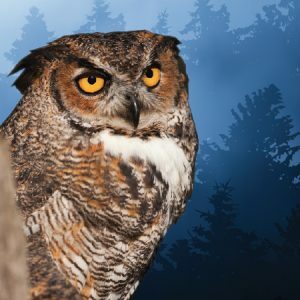 Enjoy hot chocolate, cookies, and other refreshments (with wine and beer for the grownups) and then join us for a night hike to look for owls and explore our nighttime trails. Wear walking shoes and weather-appropriate clothing. Hike guides will be carrying flashlights, but the trails will be dark. Instructor Bio: The Wildlife Center of Texas is one of the largest rehabilitation centers in the country, admitting nearly 10,000 wild patients each year. Its mission is to care for all injured, orphaned, ill, and oiled wildlife through wildlife rehabilitation, public education, and oiled wildlife response.